Nora Gasparini is a French ex-pat from Martinique who fell in love with Bali during a holiday many years ago and decided to make it her forever home. Once settled in the Island of The Gods, she developed an obsession with perfumery and became inspired by the unique fragrances in her new home. 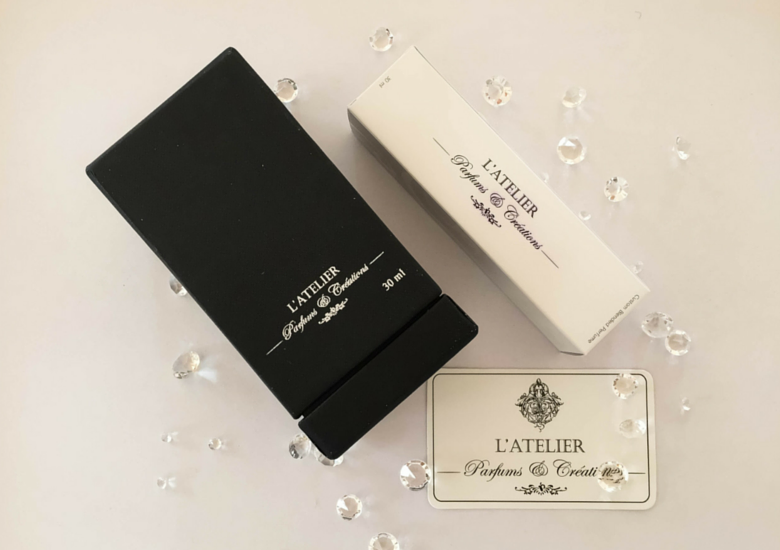 L’Atelier Parfums et Creations was born 8 years ago from her desire to provide visitors with the unique opportunity to explore all of the exciting fragrances that Bali has to offer. L’Atelier Parfums et Creations offers clients an opportunity to create their very own personalised perfume. 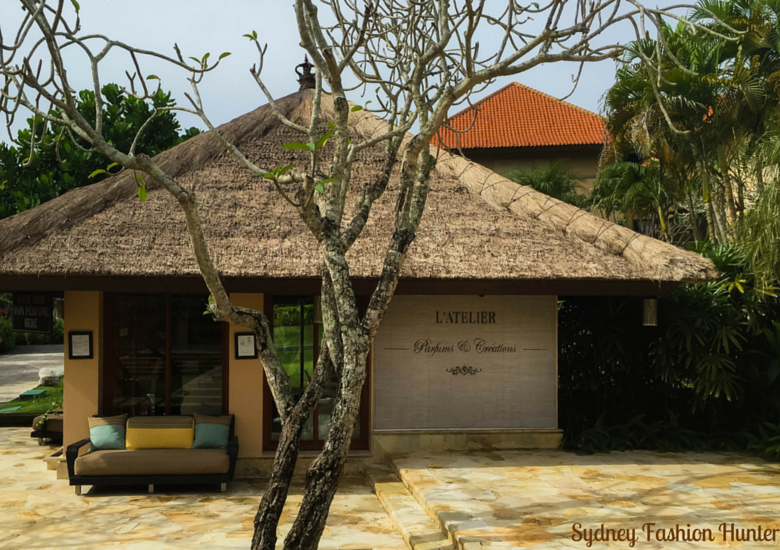 L’Atelier Parfums has two location in Bali; the original location at the Ritz Carlton in Nusa Dua and more recently at The Ayana Resort in Jimbaran. We stayed at the Magani in Legian, so I chose the Jimbaran location, which was about 30 minutes away in a taxi. 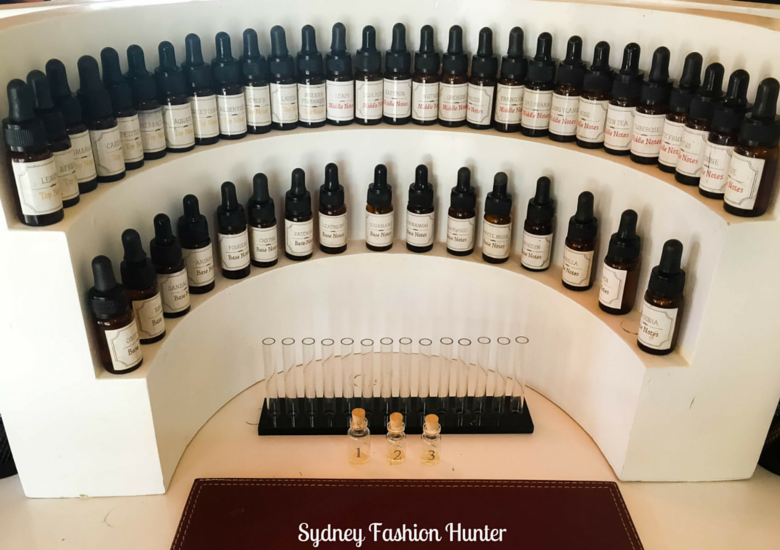 L’Atelier Parfums et Creations’ have a number of classes to suit all needs and I was so impressed I included them in my epic list of 110+ things to do in Bali. The comprehensive 3 hour workshop starts with a presentation to teach you everything you need to know about perfume making in Indonesia. You will then put what you have learned in practice as you design your very own scent. It’s perfect for those who are keen to understand the science behind the product. If you don’t have quite so much time, the 90 minute workshop skips straight to the fun part and gets you hands on from the get go. If you have little ones, an afternoon spent in a L’Atelier Parfums children’s workshop may just be the most fun thing they do in Bali. 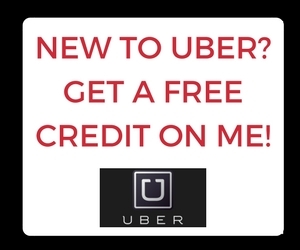 Can’t get to Jimbaran or Nusa Dua? If you have a group of 4 or more L’Atelier will come and host a private workshop in your hotel or villa for just a little more (Seminyak, Ubud and Sanur regions). Book your workshop here. Bali is a tropical paradise in South East Asia that’s draws millions of visitors each year. This tiny Indonesian island has been my go to destination for the last four years, so I’ve done many of the activities on a typical tourists ‘Bali to do list’. Each time I visit I purposefully seek out new experiences to keep the magic alive. The minute I saw L’Atelier’s perfume making workshops I knew it was for me. On arrival at the Jimbaran store Nora greeted me warmly. From her very first words I was captivated by her lilting French accent. The English translation of L’Atelier is “a studio especially for an artist or designer” and I was itching to start. Once suited up in an apron, I was seated at my very own ‘organ’. Spread out in front of me were a series of 44 fragrances with exotic names such as Champaka, Lotus and Frangipani, all waiting for me to test. With so much choice it is difficult to know where to start, but Nora was able to narrow down the choices for me with the assistance of the personality questionnaire I completed. During the workshop I got busy mixing various recipes of base, mid and top notes to create three trial vials. I recommend testing each one on your skin as they will smell quite different than in the bottle. It’s crunch time and I had to choose which sample would be made into my new perfume. I went backwards and forwards many times and I even asked The Hubs for input. I never felt rushed by Nora during this process and her patience was endless. I had it narrowed down to two when The Hubs suggested I just get both. Perfect! One bottle is included in the cost of the workshop but the additional bottle only set me back about AUD$60 with the current exchange rate. Both my creations play to my love of summer and contain vanilla and musk at the base, florals in the mid notes and fresh top notes to finish. 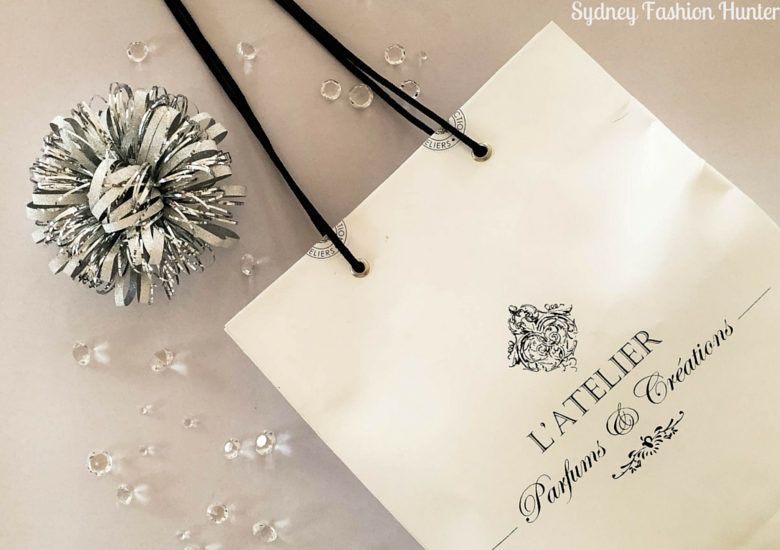 If you haven’t got a photographic memory don’t worry, you are provided with your secret recipe and it is stored in L’Atelier Parfums et Creations database to make ordering online refills a breeze. 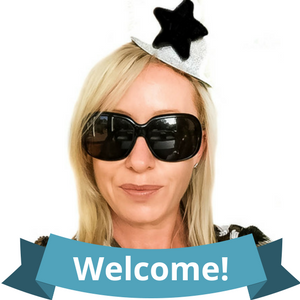 SFH: Have you ever had a client dislike the fragrance they created? NG: We try very hard to ensure that doesn’t happen. While we have never had anyone dislike the end result, we have some clients that have been overwhelmed by the process, so we are always on hand to assist. 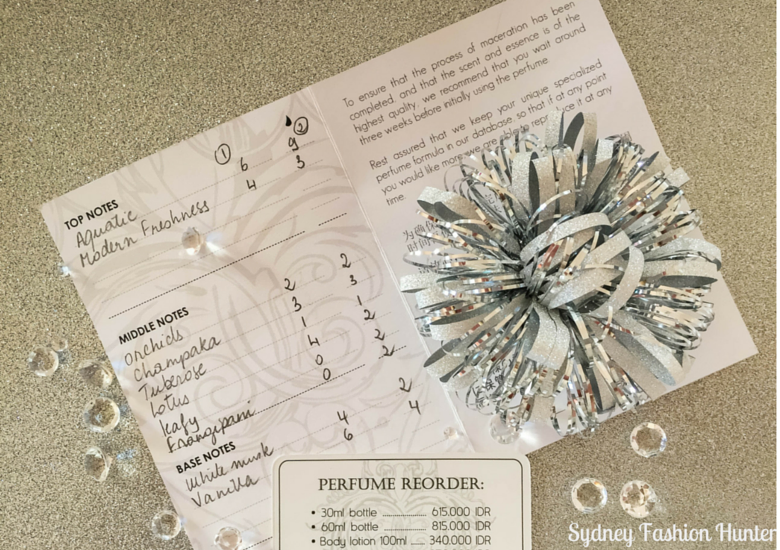 Our initial questionnaire helps us to understand each client’s personality and therefore what scents they are likely to be drawn to. 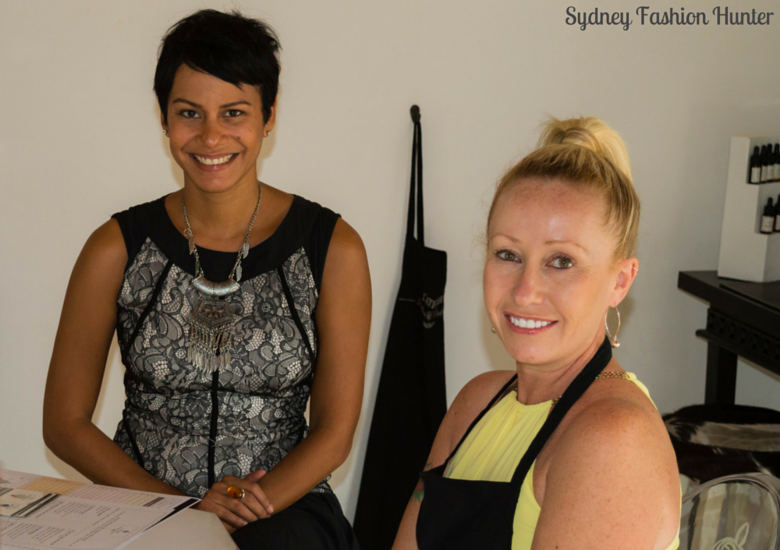 SFH: Your perfume workshops seem like a great activity for a hens afternoon or girly get togethers. Are classes popular with groups? NG: Yes we love hosting hens and their friends. We get very busy during Bali’s wedding season and its best to book in advance. It might surprise you to know that our clients are split equally between male and female. Most male guests create a special scent for a loved one rather than themselves. SFH: You have been running perfume making workshops for 8 years now, how many unique perfumes have your guests created in that time? NG: It’s been a while since I have counted but I would estimate that we have created more that 10,000. We keep all of the formulas in our database to allow easy reorders which can be shipped all over the world. SFH: The perfume I created can’t be worn for three weeks so that it can properly macerate. Will it get even better with time? NG: It really depends on the base notes that you have chosen in your formula. The more exotic scents may develop a little more after the three weeks but the lighter fresher scents usually will not. SFH: Do you have your own signature scent that you wear exclusively or do you like to mix it up? NG: I have a few combinations that I keep coming back to for special events. At the end of my workshop Nora sent me off with a wave, a smile and my new creations perfected packaged in a signature bag. The hard part was committing not to wear my perfumes for 3 whole weeks while they develop to their full potency. Pure torture! 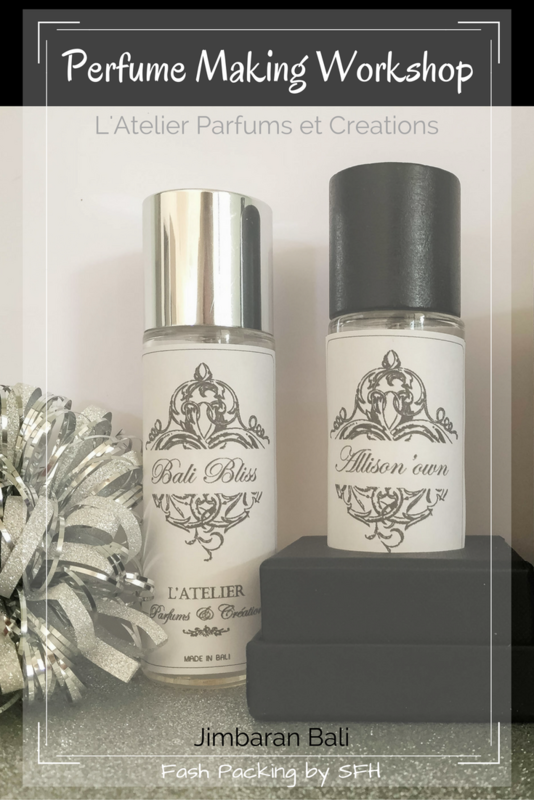 I’m sitting at my desk writing this post a little over three weeks after I visited L’Atelier Parfums et Creations. It’s winter in Sydney, the sky is grey and the heater is blasting. Before I wrote a word I spritzed myself and was immediately transported back to balmy Bali. That my friend, is the power of scent. I loved my perfume making workshop. Nora’s knowledge was incredible and I’m positive the finished product turned out so well because of her expert guidance. I’m thrilled to have a unique ‘souvenir’ of Bali that I will enjoy for a long to time come. I know that just like today, every time I wear it all the memories of this beautiful island will come flooding back. I only regret not ordering the matching body lotion as well. Just like giving birth, the creator of course gets naming rights. I hadn’t prepared for this and on the spot the best I could come up with was ‘Allison’s Own’ and ‘Bali Bliss’. Make sure you put a little more thought into this that I did! 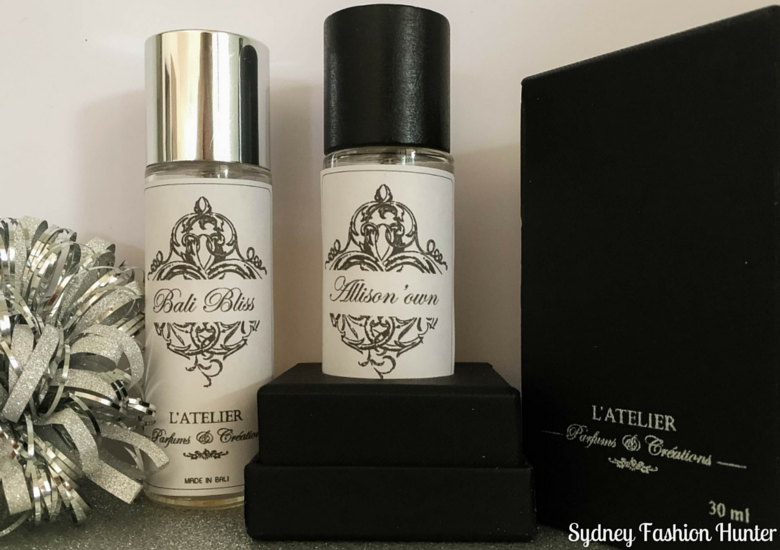 If the thought of attending one of L’Atelier Parfums perfume making workshops has you itching to get on a plane, make sure you read my tips of booking a bargain flight. Insider Tip: If you visit the Jimbaran store, book the 3pm class and you will finish just in time to catch a fabulous sunset over the water from Ayana’s Rock Bar. 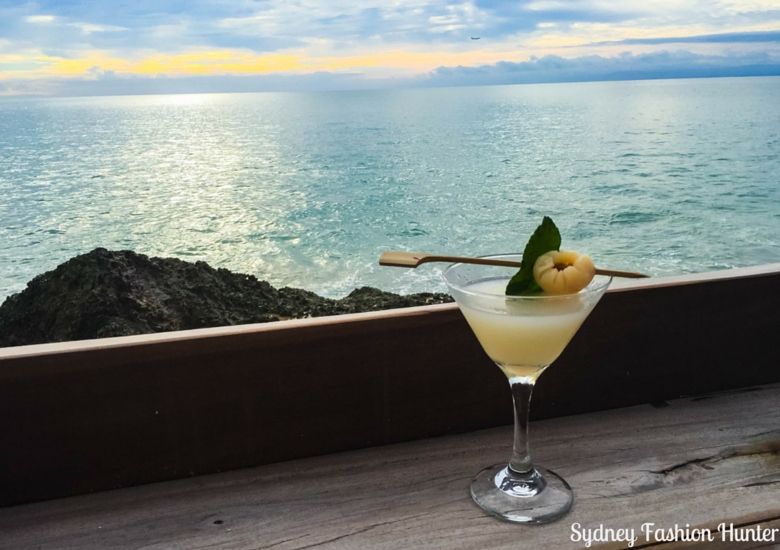 Try the lychee martini 🙂 See more of the Rock Bar here. 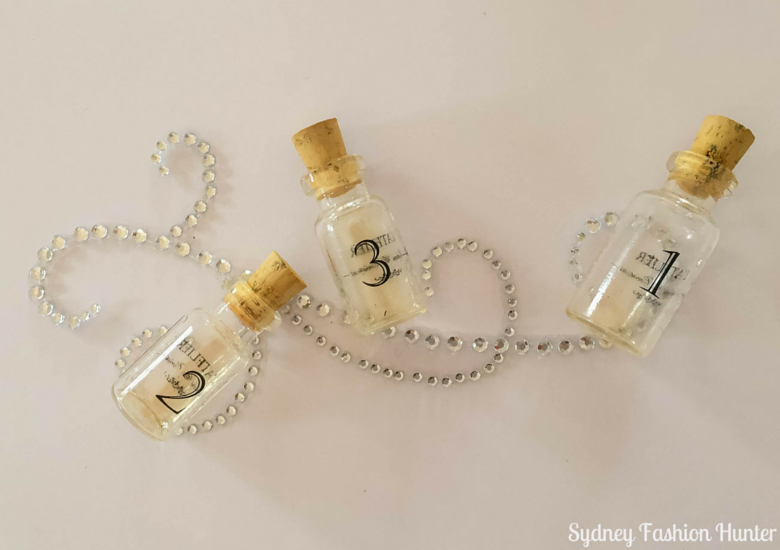 Are you keen to give perfume making a try? Let me know what your signature scent would be in the comments below. Disclaimer: I attended my perfume making workshop as a guest of L’Atelier Parfums et Creations. As always, all opinions are my own. Perfumes and the art of making perfumes is such a fascinating topic. Glad you have written about it. I found the post very interesting and it has piqued my interest in perfume making and I would love to do some more research into it. Also never knew that we had perfumeries in Bali. 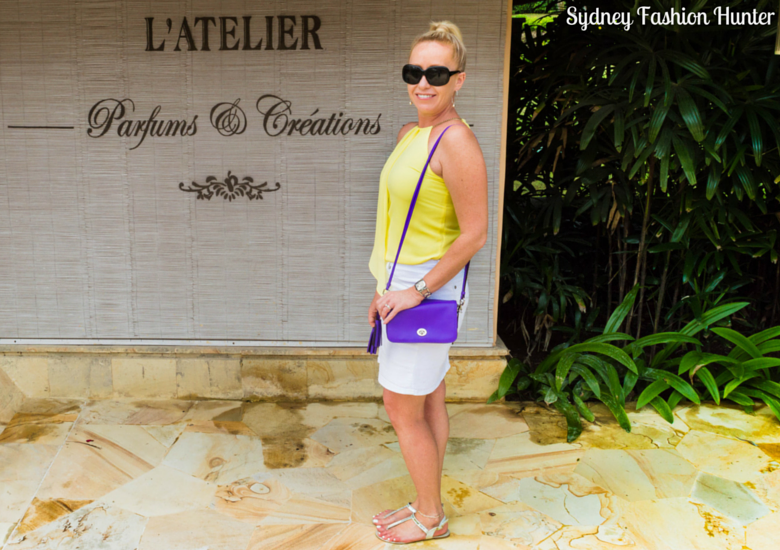 It was a surprise to me too to find L’Atelier in Bali. I love my custom perfumes ? Oh my goodness I want to do this! What an awesome experience! How much did it cost? I don’t know what would be in my creation. I like light, spring-time fragrances, a mix of fruity & floral over anything too heavy. My mum used to always wear Lily of the Valley perfume and that brings back special memories to me. Would love to incorporate that somehow. Omg! I never knew that Bali has this perfume making activity. I always thpught of Bali as a tropical getaway that has best for beaches but it looked like a peice of France is also in the area. I would totally love to try this and create a tropical feel scent. Bali has so much to offer. That’s why I keep going back ? This experience reminds me so much of the time I was in Nice and was blessed with going into a perfumerie. I think it is neat that she would call Bali home after living in Martinique – an island I hope to visit some day! It is fun to learn something new and have the guidance to select good fusions of fragrance that will go together well. Having a hands-on experience makes you relive the time spent in the destination and recommend it to others. I hope you still have some “Allison’s own” on your dresser to send you back to Bali! This is such a fun idea for an activity! 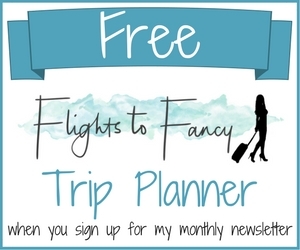 I totally agree about this being great for a bachelorette party — it’s such a unique idea. It really was a whole lot of fun. I thoroughly recommend it Cori ? Sounds like a great activity to do with the girlfriends! Don’t they have an online shop where you can order the scents you created or try signature scents? Maybe that’s how you can get the matching lotion, too! 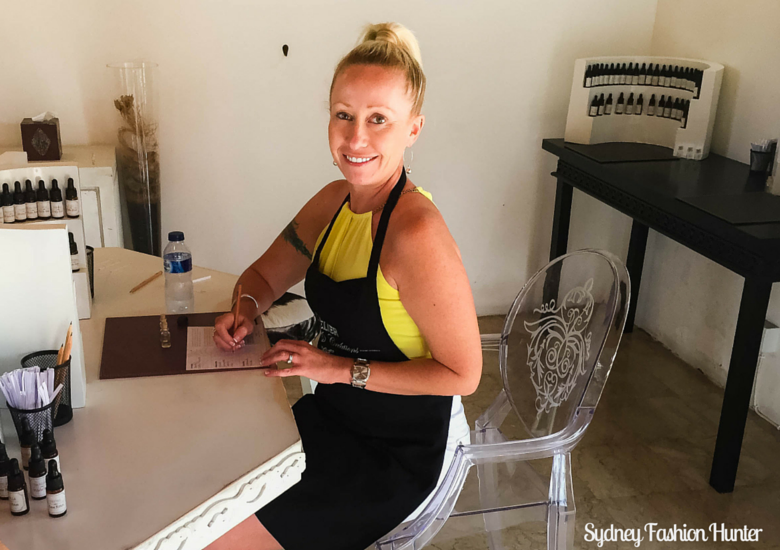 A perfume making workshop while on holiday in Bali sounds like an activity that has the potential to unlock hidden creative talents. The lychee cocktail sounds like a bonus. I feel a visit to Bali coming on soon. It was pretty cool I must say Christina and the best souveneir I have ? What a fascinating place! I would love to make my own fragrances like that. The bottles look gorgeous, what a fab keepsake from your trip. Exactly Christine. I think about Bali every time I wear it. It would have been awesome to do with a bunch of girlfriends, unfortunately they weren’t with me in Bali ? It really was special! A must do in Bali! I really enjoyed it and wouldn’t hesitate to go back. What a fabulous way to bring back a souvenir from a gorgeous place like Bali! I would love to make my own perfume one day. Better yet, two different scents! Thanks Andrea! Exactly like I did. One is never enough lol ? I’ve wanted to go to Bali forever and this is definitely something I’ll check out once I make it there. Do they speak French there or English? You definitely have to go Brianna! It’s one of my favourite places. The official language of Bali is Balinese but they also speak Indonesian (there is some cross over between the two). English is widely spoken to varying degrees of proficiency. I’m not sure how widely French is spoken there as Its not a language I know but I wouldn’t have though many would speak it. At L’Atelier English is spoken so you will have no issues. This is so cool!! So sad I didn’t know this existed when I was in Bali! What a fun experience! It was Chloe! There is always next time you go ? This is soooooooo cool!!!!!!! The location, the perfume workshop, everything!!! It really was a great afternoon Jalynn ? Dom I’m sure you could have fun trying to recreate it ? Love this coach bag. I got it in Las Vegas years ago on a whim and am so glad I do! I’ve never even thought of making my own perfume! What a unique thing to do…and in a beautiful place to boot. Thanks for posting this, I have a new “Must Do” on my list now! Fantastic Lori! I’m wearing ‘Allison’s Own’ today at work and my staff are pretty impressed with my efforts! I love a sweet scent in summer and being Bali I so know that’s what I’d create! I can’t wait to start planning a trip there (I keep asking my partner if we can go) so I can give this ago! You won’t be sorry Ashleigh! The Hubs was very reluctant the first time I suggested Bali. Now after 5 visits he loves it as much as I do! This is so cool! I can see how it can get overwhelming, but they seem to have a great crew ready to assist. I thought it was cool that they have a lot of guys make them for their significant others! Wow what a gorgeous experience! A signature scent is ultimate! Thanks Carly! It was very special and a log of fun! Sounds like fabulous fun, I’d love to have a go. It’s good that you have help, I can imagine having a choice of all the available scents would be totally overwhelming, like me trying to choose a colour when I get a manicure! It really was great. I’m in the early stages of planning a group trip to Bali in 2018 (yes that’s how long it takes to get my group together!!!!) and am planning to take all BFF’s along ? This looks like such fun and it would be lovely to have your own unique scent!